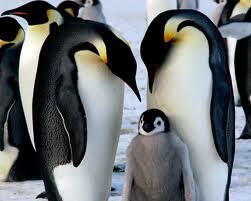 lots of animals in Antarctica look innocent and very beautiful but every animal is dangerous like seals. King penguins are the second largest of the penguin species, on average they are around 15kg (33lb) and 95cm (3.1ft) high. Like many penguins, fully grown but unfledged chicks can appear to be larger than the adult birds, they were sometimes known as "woolly penguins" by the early explorers as the thick brown down of the juveniles looks like wool on sheep. Some even thought they were a separate species. King penguins have colourful feathers around their necks and heads, with they are the brightest of all the species of penguin and there is an estimated world population of 2 million breeding pairs (some estimates up to 3.2 million). King penguins don't make a nest, not even the perfunctory small pile of stones that other penguin species go for.Instead, they lay only one egg at a time and carry it around on their feet covered with a flap of abdominal skin called the brood patch. It is looked after in this manner for the whole of the average 55 day incubation period, being shuffled from one parent to the other every 6-18 days. When relieved of the egg, that parent then goes off to sea on an extended food foraging trip. Weddell seals are animals of the ice. They live further south than any other mammal. Between the end of August and early November in the southern hemisphere spring, the females haul themselves out of holes in the ice and give birth to their pups. Weddell seals prefer to live on ice that is broken up somewhat, in this way there are often natural cracks and holes through the ice that they can use to get in and out of the sea. There are also holes and cracks around ice bergs that are trapped in sea-ice and often "tide-cracks" appear near when near land, all of these help. These holes are fine to begin with, but when temperatures are well below freezing, they begin to freeze up - quickly. The seals keep the holes open by rasping them with their teeth. They open their mouths wide and move their heads back and forward in a wide arc attacking the ice that is building up around the sides of the hole. This is a very fast and vigorous process that takes a lot of energy and a toll on the seals teeth. .The arctic fox , also known as the white fox, polar fox or snow fox, is a small fox native to Arctic regions of the Northen Hemisphere and is common throughout the Arctic tundra diome. It is well adapted to living in cold environments. It has a deep thick fur which is brown in summer and white in winter. It averages in size at about 85.3 cm (33.6 in) in body length, with a generally rounded body shape to minimize the escape of body heat.They prey on any small animals they can find, including lemming, voles, ringed seal pups, fish, and bird eggs. They will also eat carrion, berries, and seaweed. They form monogamous pairs during the breeding season and usually stay together in family groups of multiple generations in complex underground dens. The arctic fox has such keen hearing that it can precisely locate the position of prey under the snow. When it finds prey, it pounces and punches through the snow to catch its victim. Its fur changes colour with the seasons: in the winter it is white to blend in with snow, while in the summer it is brown. the arctic fox is a beautiful animal but it is very rear to see a arctic fox in the wild . The killer whale also referred to as the orca whale or orca, and less commonly as the black fish, is a toothed whale belonging to theoceanic dolphin family. Killer whales are found in all oceans, from the frigid Artic and Antarctica regions to tropical seas. Killer whales as a species have a diverse diet, although individual populations often specialize in particular types of prey. Some feed exclusively on fish, while others hunt marine mammals such as sea lion, seals, walruses , and even large whales. Killer whales are regarded as apex predators, lacking natural predators.Killer whales are highly social; some populations are composed of matrilineal family groups which are the most stable of any animal species. Their sophisticated hunting techniques and vocal behaviors, which are often specific to a particular group and passed across generations, have been described as manifestations of culture.